Please refer to our stock # Af111 when inquiring. 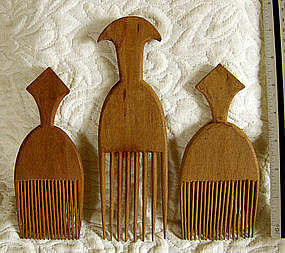 This collection of 3 hand carved wooden hair combs is from the Nigerian Yoruba tribe. They were brought to the US by a (then young) anthropologist who traveled extensively in Africa during the early 1960's and have been retained in his personal collection until recently. The taller center comb is 8 inches and the shorter combs on the sides are 4.25 inches. I prefer to sell them as a collection.